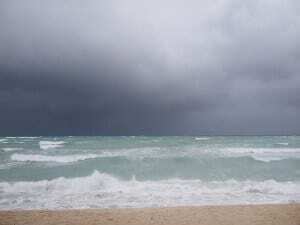 Hurricane Sandy, currently making its way through Cuba, is predicted to collide with an unexpected set of atmospheric and astronomical conditions to form what’s called a super storm. The storm is predicted to be mixed with a cold front, a wet and windy storm and a full moon, which will lift costal tides, intensifying the damage. This hurricane, also known as “Frankenstorm” is making its way to the western and central Bahamas and will touch southeast Florida. However, it is the likely encounter with the Mid-Atlantic and Northeast U.S. that has meteorologists worried. Hurricane Sandy has the potential to cause millions of dollars’ worth of damage. Over the past day, Hurricane Sandy has intensified, growing to about 1500 miles in diameter. According to Gary Best, a meteorologist for Hometown Forecast Services Inc. in Nashua, New Hampshire, “A very complicated situation is going on right now. As it moves across the western Atlantic, it is going to encounter a dip in the jet stream. There will be a lot of energy coming in from the West and it may try to capture the storm and pull it into the U.S. coastline. The now Category 2 storm is expected to bring torrential rains resulting in flooding, power outages and blocked roads as well as extremely powerful winds. According to estimates by Tropical Storm Risk, a group of experts on insurance, risk management and climate, New York City will suffer from wind and flood damage with a 55 percent chance of winds of at least 39 mph by October 30th. National Hurricane Center officials warn people living from North Carolina to Maine to keep a close eye on Hurricane Sandy. I simply want to tell you that I’m newbie to blogs and certainly loved you’re web-site. Probably I’m planning to bookmark your blog . You really come with impressive stories. Regards for sharing with us your web site. Pingback: un cuarenta por ciento de los estudiantes estudia periodismo o español.